We explain how to install and set up the game on Android, how the monetization system works, and also offer a little guide to help you get started. 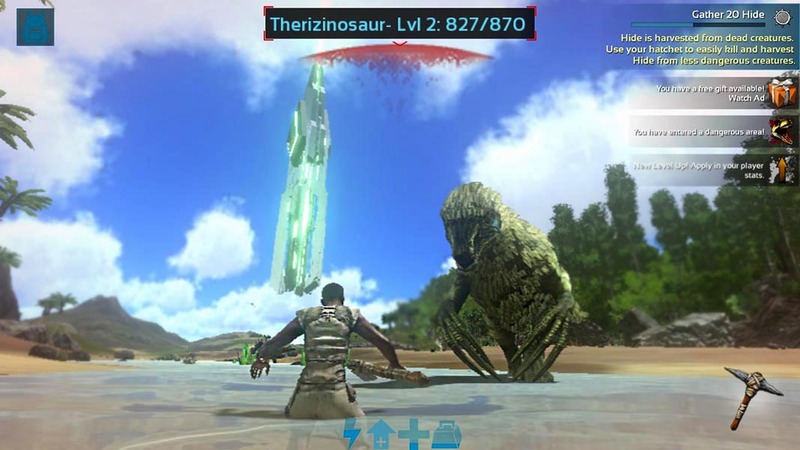 As we’ve known for months now, June 14 was the date selected for the release of the iOS and Android versions of the well-known ARK: Survival Evolved. The success of the game on PC and consoles is undeniable, as demonstrated by the fact that, one year after its official release, it’s still found among the top 10 most played games on Steam. That’s why there’s a lot of high expectations for this release that, unlike the original version, is completely free, although there’s a paid mode that offers some interesting advantages. The requirements are huge, and it’s definitely one of the most demanding games you’ll find for Android: 3GB of RAM and Android 7.0 (or a device compatible with the Vulcan graphics API). Plus, even if your device meets these requirements, it’s going to work up a sweat if you want to put the graphics to the max. The Unreal Engine 4 is heavy on all levels given the extreme detail shown in its representation of the game’s beautiful island. As far as installation goes, you’ll need to consider the fact that the game is going to take up at least 2GB of local space on your device. Thus, the download from Uptodown is done from an XAPK file that includes additional data. This means you need to have the our official Android app installed or a compatible package installer. First of all, let’s be clear here: even though there’s an in-app store and a premium version, absolutely all the game’s content can be obtained without paying a single penny. It all revolves around the so-called Ancient Amber, which is the main currency in the game and lets you get temporary experience bonuses, improve your stats temporarily, or get rare items. The Ancient Amber can be bought with real money or earned in the game. Sometimes the more powerful dinosaurs release it, although you’ll also find it scattered around the island. You can also get it by watching ads in the game or through the free daily login rewards. 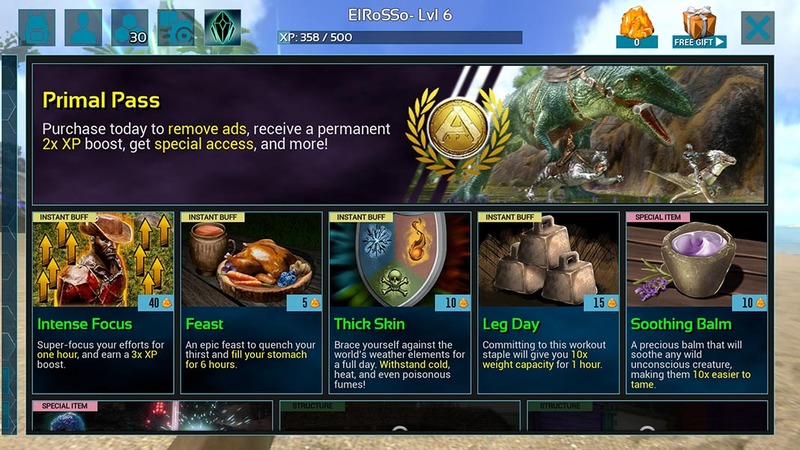 On the other hand, there’s the Primal Pass, a subscription model where, for $3.99 a month, you get a permanent experience bonus, get rid of all the in-app ads and also get priority when it comes to accessing the game’s servers, among other advantages. 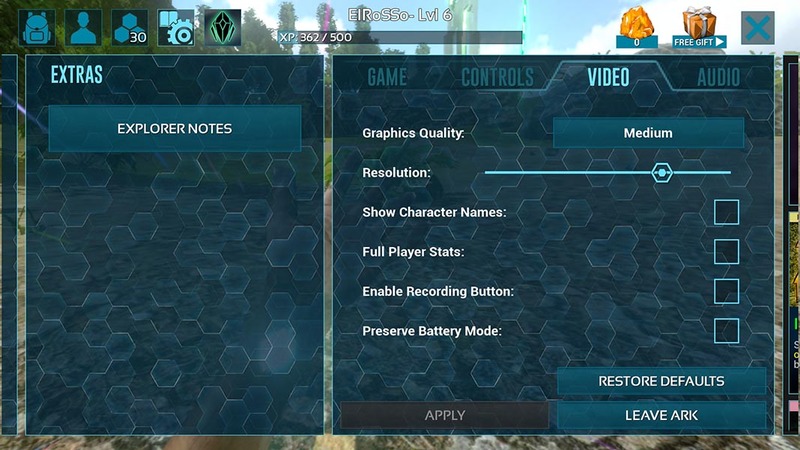 Graphics Quality: You’ll have low, medium, and “epic.” Leaving it at medium will get rid of almost all real-time illumination and shadow effects, making the game run much better. But if you’re not picky, you can play with the lowest setting. Resolution: the game includes antialiasing and standard post-processed filters so if you lower the resolution below your screens native levels, you won’t notice a difference. Even if you reduce it to 50%, the experience is still good enough, at least on screens that are smaller than 6 inches. 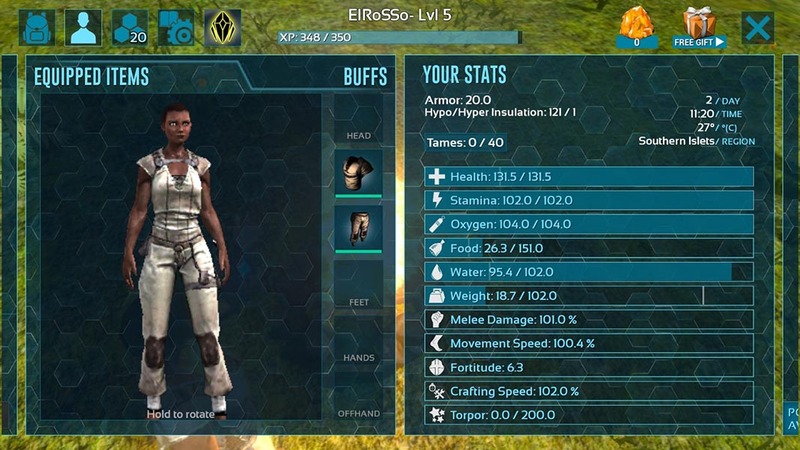 After creating your character, the initial game experience in ARK depends on your speed in getting basic resources to build your tiny shelter and equipment to craft materials and defend yourself from the medium-sized dinosaurs you come across. 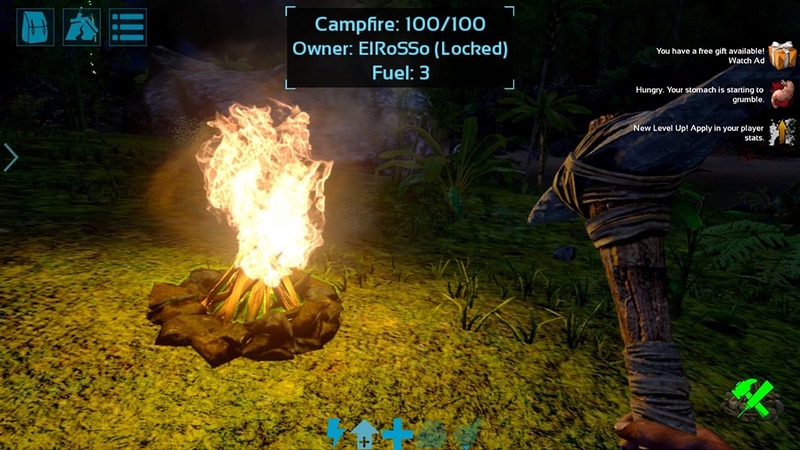 Luckily, the game provides a tutorial to follow and learn the basic control mechanics and also explains how to build your first tools, build a fire, and hunt for food and cook it. There’s no reason to be afraid of dying, since your character and level won’t disappear, but instead, you’ll reappear nearby on the island, letting you collect your lost equipment (if another player doesn’t get to it first). It’s sort of a mix between Minecraft and an action MMO. The bushes will provide you with berries to eat, which is much safer than the wild dinosaur meat that’s roaming around. In the beginning, you’ll use your fists to get wood from the trees and collect stones from the ground. This is enough to start buying recipes to build objects. The pick and the ax are the very first ones you’ll need in order to get basic resources for walls and bigger vegetation. Since there’s no problem in the beginning with the max load or inventory, you’ll collect everything you can find. In addition to killing enemies, your experience is taken to the next level by being able to steal their equipment and even their blood, letting you distribute the points you get to improve your character’s different attributes (fatigue, load, life, speed, etc.). On the other hand, you need to level up to buy new recipes to unlock more weapons, tools, and equipment. It’s an endless cycle…like the circle of life in the Lion King, but with prehistoric creatures. From there, it’s up to you what you want to do in the game. Take into account that just on your server, there will be 50 players that may or may not be friendly, so the location of your shelter and the relations you establish will be fundamental to prosper. There’s no end of things to do, just like in the original game: you can tame giant dinosaurs, erect enormous communal castles, discover alien technology, and develop futuristic weapons. You’ll get to experience it all, as long and your phone doesn’t burn up before you do.